The LogTag UTRID-16 provides a display to allow immediate viewing of current and past temperature and alarm statistics as well as the facility to create a detailed PDF report without need for extra accessories and proprietary software. The display shows recording status, current temperature, alarm status of up to six user-configurable alarms and duration of any temperature excursions. When the UTRID-16 is connected to a computer using the integrated USB plug, a detailed PDF report of the recorded temperature data and alarms can be automatically generated. For more detailed data analysis, the UTRID-16 also creates an encrypted data file compatible with LogTag Analyzer® operating software and data management options. A real time clock provides date/time stamps for each temperature reading. 'Pause Mark' feature to prevent falsified statistics data from inspection. Power saving feature - automatic display turn off after 30 seconds to extend battery life. Accuracy Better than ±0.5°C (±0.9°F) for -20°C to +40°C (-4°F to +104°F). Better than ±0.7°C (±1.3°F) for -25°C to -20°C (-13°F to -4°F) & +40°C to +60°C (+104°F to +140°F). Sensor Reaction Time Typically less than 5 minutes (T90) in moving air (1m/s). 112 days @ 10min logging, 168 days @ 15min logging. Statistics memory (for display on LCD): Max/Min values and alarm duration values. Sampling Frequency Configurable from 30 seconds to 18 hours. Logging Start Options Push button start or specific date & time. Optional start delay of up to 72 hours. Download Time Typically with full memory (16,129 readings) in less than 30 seconds from time of insertion to availability of PDF report. Environmental IEC 60529: IP64 with USB cap fitted. Power Source 3V CR2032 Battery. 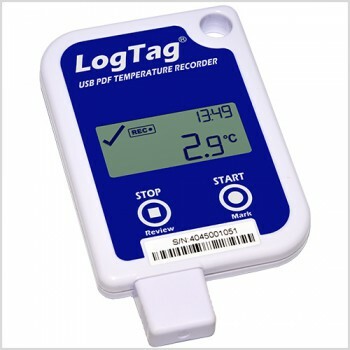 Battery Life Typically 2 years of operation with normal use (6 minute logging, statistics reviewed on the display no more than once daily for no longer than 30 seconds each time, download data monthly) provided Logger is kept within the Storage Temperature Range when not in use. Connection Interface USB 2.0, A-type plug. Software PDF Reader, LogTag® Analyzer 2.8 or higher. PDF Report One page report with trip and alarm summary. Multi-page report with list of readings, including date and time. Other Features • Optional clearing of alert indication by push button (places inspection make at same time). • Comprehensive Alarm trigger configuration. Learn how to quickly operate the UTRID-16 device following the step-by-step instructions. Click here download the UTRID-16 Quickstart Guide. Get access to our free software which you can use with the UTRID-16 device.